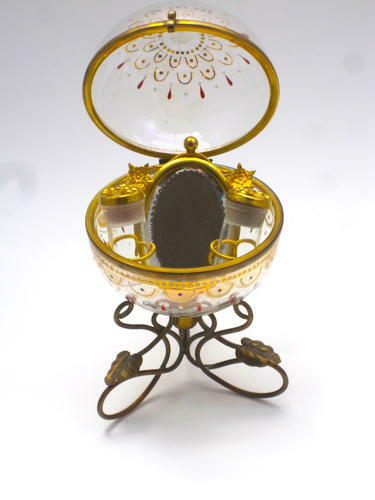 Unusual French 19th Century Crystal Glass Spherical Perfume Casket Enclosing 2 Original Perfume Bottles and Mirror ! The Sphere is Hand Painted Pretty Enamelling - in Perfect Condition. This Perfume Casket Rests on 3 Dore Bronze Feet Decorated with Leaves. So Unusual to have the Mirror Inside Too, Wonderful Model.